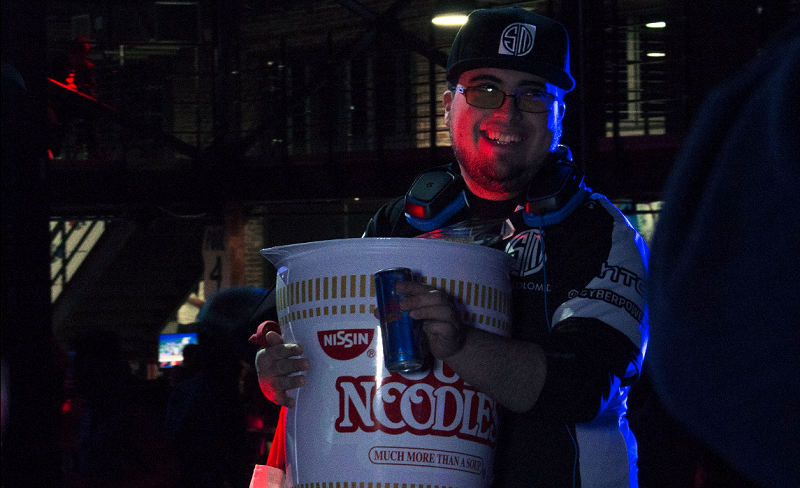 ZeRo holding a giant cup of noodles after winning Gensis Saga. Image credit: Esports Arena. At Saturday’s 2GGC: Genesis Saga tournament for Smash Wii U, accomplished Diddy Kong player Gonzalo “ZeRo” Barrios appeared to stroll through the winner’s bracket with ease, eventually taking the grand finals three games to one against challenger Komorikiri’s Cloud Strife. So naturally he was awarded a crap-ton of noodles in addition to his nearly $3,500 prize winnings. This might seem kind of weird, even for a fight game tournament, but the event was sponsored by FoodBeast and Cup Noodles, making it a little more understandable. In fact, I’d take a giant cup of noodles over a bag of rice, which was pro Smash player Kamemushi’s prize for winning the 25th Umebura tournament last fall, any day. And so there were cups of noodles everywhere at the eSports Arena in Orange County, California. Cup Noodle, a Nissin product “invented” by the company’s, founder Momofuku Ando in the late 1950s, has been getting increasingly aggressive with its marketing lately. It appears the food company is under the impression that people who play games in particular have a penchant for eating nothing but warmed bricks of broth-soaked starch all day. You might remember that Cup Noodle was one of Final Fantasy XV’s more explicit sponsored products, with Noctis & Co. chowing down on the vending machine food in-between hunting monsters in the wild. There was even a special Final Fantasy XV commercial built entirely around the engineered food product. Not that this is the first time Cup Noodle has attempted to throw its styrofoam weight around through more unusual ad campaigns. And who can blame them? The Coke to Maruchan’s Pepsi, Cup Noodle has a loyal customer base to protect and expand, or else risk allowing other sodium crusted delights to come in and steal their lunch. To Cup Noodles’ credit, their involvement in the tournament benefited players by adding an additional $2,000 to the total prize pool. And with the Inauguration just around the corner, we could probably all stand to have a giant cup of freezer dried calories keeping us company at home. You can watch the full 2GGC: Gensis Saga grand finals below. ZeRo, along with a bunch of other top talent from across both Smash Wii U and Smash Bros. Melee, will be competing next weekend at Genesis 4 in San Jose, California.